For those of you waiting and searching for more triple SIM phones, the Samsung Galaxy Star Trios GT-S5283B has been launched in Brazil. Before Samsung, we have seen LG's triple SIM Android smartphone with tri SIM card slots, the Optimus L1 II Tri, which is also available there. Samsung Galaxy Star Trios is a low-end device that will initially be available in Brazil with some other markets getting it at a later date. The GT-S5283B looks like a slightly updated Galaxy Star S5280 which was released in the first half of 2013. Samsung Galaxy Star Trios GT-S5283B features include Android 4.1 Jelly Bean OS, 1GHz single-core Qualcomm Snapdragon S1 chip, a 3.14-inch QVGA (240 x 320) screen, a 2-megapixel rear camera, 512MB of RAM, 4GB of expandable internal memory, HSDPA and Wi-Fi 802.11b/g/n connectivity, and a 1,300 mAh battery. The Samsung Galaxy Star Trios GT-S5283B is available in either black, or white via many retailers in Brazil. For more information about the Samsung Galaxy Star Trios triple SIM phone, you can check out the Trio's page at Samsung's local website in Brazil. 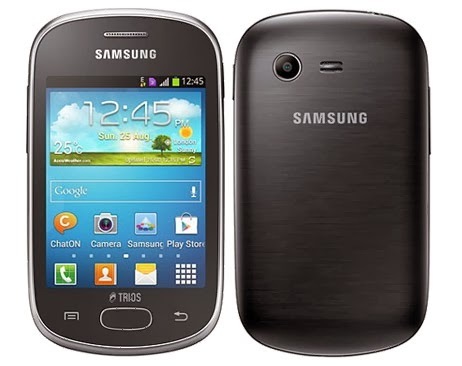 0 comments on "Samsung Galaxy Star Trios GT-S5283B (triple SIM phone) launched in Brazil"